It is no secret that Samsung is gearing up for the launch of their Galaxy S5 this year. The Galaxy flagship hardware has headlined Android for years now, but Samsung is still making tweaks on the software front. The latest peek into what we might see from Samsung in the near future is the newly leaked Life Times app that looks to keep your life documented easily. The good people over at SamMobile came across this app included in a firmware build for a Samsung device with the model number SM-G900H. While they cannot confirm that model relates to the S5, Samsung does have a tradition of announcing new software apps for their new flagships. 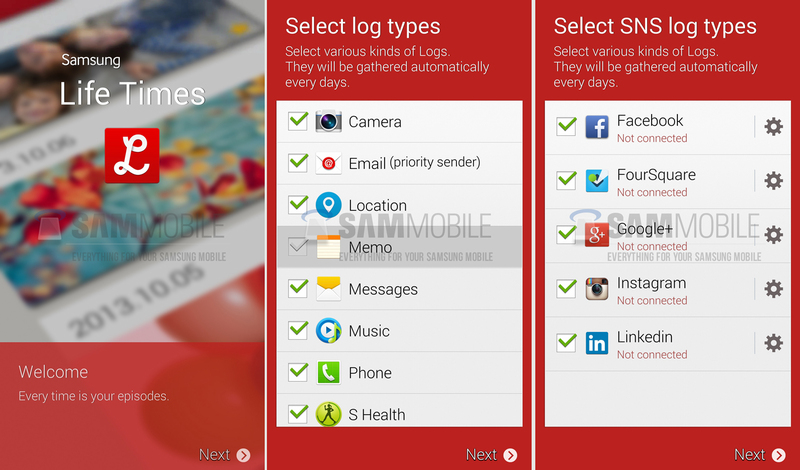 Life Times is similar to the Story Album application that Samsung already runs, but with a few more capabilities. Life Times gathers your photos and videos and adds them to this virtual diary, but doesn’t stop there. This new application will take note of text messages, phone calls and taps into your social networks as well to tell the whole story, not just images from one source. This will more than likely be an opt-in service, so Samsung doesn’t have access to all your photos and videos right off the bat. Do you use Samsung’s Story Album app now? Does Life Times look like something you would use?